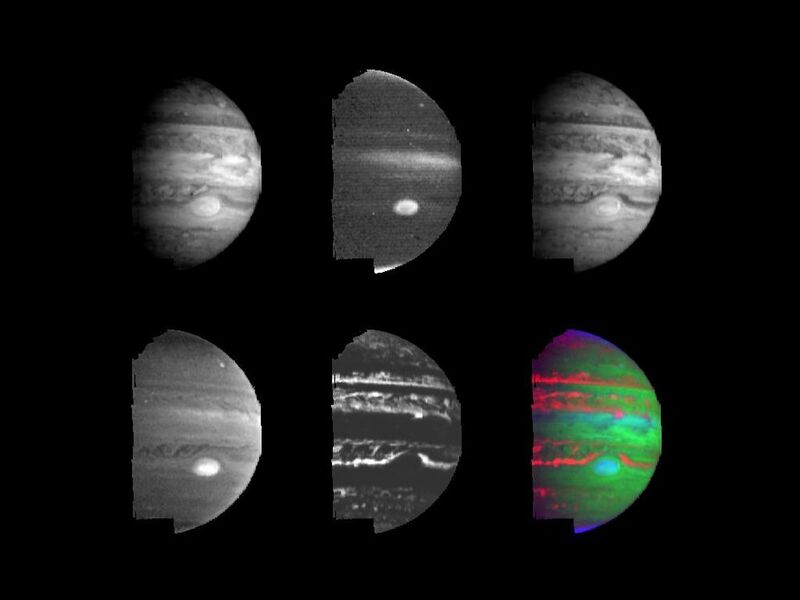 Clouds and hazes at various altitudes within the dynamic Jovian atmosphere are revealed by multi-color imaging taken by the Near-Infrared Mapping Spectrometer (NIMS) onboard the Galileo spacecraft. These images were taken during the second orbit (G2) on September 5, 1996 from an early-morning vantage point 2.1 million kilometers (1.3 million miles) above Jupiter. They show the planet's appearance as viewed at various near-infrared wavelengths, with distinct differences due primarily to variations in the altitudes and opacities of the cloud systems. The top left and right images, taken at 1.61 microns and 2.73 microns respectively, show relatively clear views of the deep atmosphere, with clouds down to a level about three times the atmospheric pressure at the Earth's surface. By contrast, the middle image in top row, taken at 2.17 microns, shows only the highest altitude clouds and hazes. This wavelength is severely affected by the absorption of light by hydrogen gas, the main constituent of Jupiter's atmosphere. Therefore, only the Great Red Spot, the highest equatorial clouds, a small feature at mid-northern latitudes, and thin, high photochemical polar hazes can be seen. In the lower left image, at 3.01 microns, deeper clouds can be seen dimly against gaseous ammonia and methane absorption. 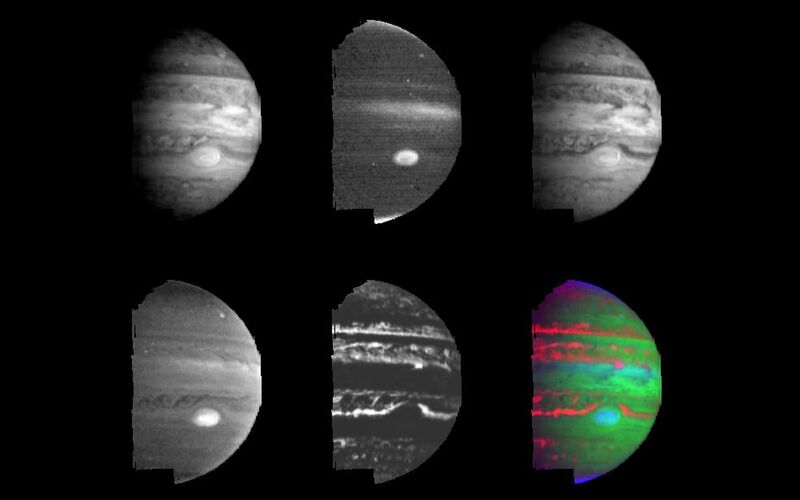 In the lower middle image, at 4.99 microns, the light observed is the planet's own indigenous heat from the deep, warm atmosphere. The false color image (lower right) succinctly shows various cloud and haze levels seen in the Jovian atmosphere. This image indicates the temperature and altitude at which the light being observed is produced. Thermally-rich red areas denote high temperatures from photons in the deep atmosphere leaking through minimal cloud cover; green denotes cool temperatures of the tropospheric clouds; blue denotes cold of the upper troposphere and lower stratosphere. The polar regions appear purplish, because small-particle hazes allow leakage and reflectivity, while yellowish regions at temperate latitudes may indicate tropospheric clouds with small particles which also allow leakage. A mix of high and low-altitude aerosols causes the aqua appearance of the Great Red Spot and equatorial region. This image and other images and data received from Galileo are posted on the World Wide Web Galileo mission home page at http://galileo.jpl.nasa.gov.